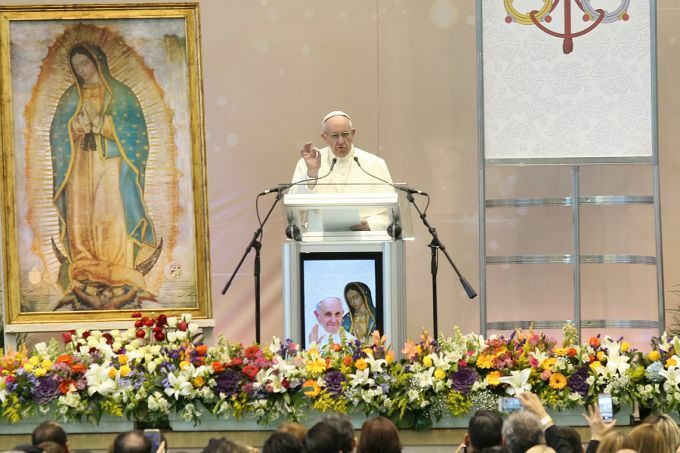 Juarez, Mexico, Feb 17, 2016 / 11:45 am (CNA).- Update: 3:00 pm EST – Read the full text of Pope Francis’ prepared remarks for his Feb. 17 meeting with the world of labour at the Bachilleres College in the state of Chihuahua. I wanted to meet with you here in this land of Juárez, because of the special relationship this city has with the world of labour. I am grateful not only for your words of welcome and for your testimonies, which reveal the anxieties, joys and hopes of your lives, but also for this opportunity to share and reflect together. Anything we can do to foster dialogue, encounter, and the search for better alternatives and opportunities is already an accomplishment to be valued and highlighted. Obviously more needs to be done, and today we do not have the luxury of missing any chance to encounter, discuss, confront or search. This is the only way we will be able to build for tomorrow, to create sustainable relationships capable of providing the needed framework that, little by little, will rebuild the social bonds so damaged by a lack of communication and by a lack of the minimal respect necessary for a healthy coexistence. So I thank you, and I hope that this occasion may serve to build the future. May it be a good opportunity to forge the Mexico that its people and children deserve. I would like to dwell on this latter point. Here today there are various workers’ organizations and representatives of Commerce Chambers and business associations. At first sight they could be considered as adversaries, but they are united by the same responsibility: seeking to create employment opportunities which are dignified and truly beneficial for society and especially for the young of this land. One of the greatest scourges for young people is the lack of opportunities for study and for sustainable and profitable work, which would permit them to work for the future. In many cases, this lack of opportunity leads to situations of poverty. This poverty then becomes the best breeding ground for the young to fall into the cycle of drug trafficking and violence. It is a luxury which no one can afford; we cannot allow the present and future of Mexico to be alone and abandoned. Unfortunately, the times we live in have imposed the paradigm of economic utility as the starting point for personal relationships. The prevailing mentality advocates for the greatest possible profits, immediately and at any cost. This not only causes the ethical dimension of business to be lost, but it also forgets that the best investment we can make is in people, in individual persons and in families. The best investment is creating opportunities. The prevailing mentality puts the flow of people at the service of the flow of capital, resulting in many cases in the exploitation of employees as if they were objects to be used and discarded (cf. Laudato Si’, 123). God will hold us accountable for the slaves of our day, and we must do everything to make sure that these situations do not happen again. The flow of capital cannot decide the flow and life of people. When faced with tenets of the Church’s Social Doctrine, it is objected frequently: “These teachings would have us be charitable organizations or that we transform our businesses into philanthropic institutions”. The only aspiration of the Church’s Social Doctrine is to guard over the integrity of people and social structures. Every time that, for whatever reason, this integrity is threatened or reduced to a consumer good, the Church’s Social Doctrine will be a prophetic voice to protect us all from being lost in the seductive sea of ambition. Every time that a person’s integrity is violated, society, in a certain sense, begins to decline. This is against no one, but in favour of all. Every sector has the obligation of looking out for the good of all; we are all in the same boat. We all have to struggle to make sure that work is a humanizing moment which looks to the future; that it is a space for building up society and each person’s participation in it. This attitude not only provides an immediate improvement, but in the long run it will also transform society into a culture capable of promoting a dignified space for everyone. This culture, born many times out of tension, is creating a new style of relationships, a new kind of nation. What kind of world do we want to leave our children? I believe that the vast majority of us can agree. This is precisely our horizon, our goal, and we have to come together and work for this. It is always good to think about what I would like to leave my children; it is also a good way to think of others’ children. What kind of Mexico do you want to leave your children? Do you want to leave them the memory of exploitation, of insufficient pay, of workplace harassment? Or do you want to leave them a culture which recalls dignified work, a proper roof, and land to be worked? What type of culture do we want for those who will come after us? What air will they breathe? An air tainted by corruption, violence, insecurity and suspicion, or, on the contrary, an air capable of generating alternatives, renewal and change? I know that the issues raised are not easy, but it is worse to leave the future in the hands of corruption, brutality and the lack of equity. I know it is often not easy to bring all parties together in negotiations, but it is worse, and we end up doing more harm, when there is a lack of negotiations and appreciation. I know it is not easy to get along in an increasingly competitive world, but it is worse to allow the competitive world to ruin the destiny of the people. Profit and capital are not a good over and above the human person; they are at the service of the common good. When the common good is used only in the service of profit and capital, the only thing gained is known as exclusion. I began by thanking you for this opportunity to be together. I wish now to invite you to dream of Mexico, to build the Mexico that your children deserve; a Mexico where no one is first, second, or fourth; a Mexico where each sees in the other the dignity of a child of God. May our Lady of Guadalupe, who made herself known to Juan Diego, and revealed how the seemingly abandoned were her privileged witnesses, help and accompany us in this our work.